SIGN UP NOW For FREE, No fees, no obligations! Our profiles ensure that you are properly informed to make the right channel partner decisions. No more guesswork! Qupact enables businesses to find, engage and manage the right sales channel partners using its unique application, dataPACT. Allowing companies to develop a channel management strategy. Since 2002, Qupact has found and engaged sales partners for clients from food and beverages to embedded software. executives and sales people who have applied it in their daily businesses. Today the company is based in Ireland and the Netherlands. Qupact’s focus is on the route-to-market, not the product. 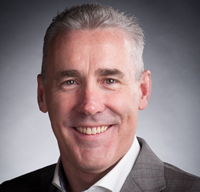 Qupact was established by Brian English, an Internationally recognised expert in sales channel development, former Vice President at Emerson (St. Louis) and group Managing Director with XP Power (London). Over the years, he has delivered on many prestigious management development programs at business schools such as the IMI (Dublin) and various universities (Cambridge and Rotterdam). His ambition is to make best-in-class channel development practices available to all companies, at a level of cost that they can afford. Looking for Export Sales Channels? What is a Sales Strategy Pyramid? One of the biggest challenges our clients face when developing their sales channel is partner training. It's an aspect of channel development that is definitely often overlooked, it's time consuming, it takes sales resources and there's always that element of "grandma sucking eggs" whenever you stand in front of an experienced sales team and "tell them how to do their jobs". An effective and inspirational training programme is a crucial part of any successful channel strategy. As a vendor, it is your time in front of the sales team, your ability to differentiate your product from other lines they carry, your chance to make an impression, galvanize and inspire them to sell. It might be the only chance you're able to get your message across, so it's imperative you use the time well. So, what should an excellent channel training session do? You'd do well to remember that this is as much about selling as it would be about training. Here, on the other hand you are not just selling the product but the entire channel package: product, support, pricing and incentives.Dealing with your partner as a customer first and a partner second helps to clarify your objectives. Differentiate - It is vital that your product and support package stands out from the rest. Remember that this is often competition for mindshare so focus on what sets your package apart. Could it be your 24/ 7 technical support? The feature set of the product or The ROI tool on your website? Remind - Your partner teams may carry a wide range of products, some that are likely to compete with yours, so making it simple to remember those key USPs is crucial if you want your message to stick. Take a step back and boil your message down into the crucial "must know" bullet points - focus on those. Inform - Get the salient facts across within a simple and memorable way. The golden rule is to make life easy, your partners have a tendency to look favourably on merchandise that are easy to position, qualify and sell. Persuade - Success in the channel requires you to market on two levels markets - the story you tell to an end user may not be the same story you tell to a channel partner. Focus on what adds value for the partner sales team, what makes it an easy sell, what makes it lucrative for them, what makes you the partner of choice for these types of opportunities. So - keep the messages simple and arm your partners with the tools they need to differentiate, position and qualify your product. At Qupact International, we specialize in identifying and engaging with the optimal sales and distribution partners on behalf of our clients according to their specific business needs. It is a practice we have grown highly proficient at over our 14 years in business and we take great pride in being able to help grow our clients business through management of their sales channels in foreign markets. However, we also add significant value to those companies that prefer to manage their own sales channels but have difficulty finding the right distribution partners for their business and enacting an efficient, cost-effective distribution sales strategy. We carry out a bespoke sales partner search in our clients target market. We generally identifying between 30-60 potential partners, that are input into our web-optimized application, dataPACT, along with a pre-requisite guided rating and complete company profile. dataPACT constitutes the backbone of our service being the ideal platform on which to present and interpret complex sales data. dataPACT has a number of tools that our clients can use to generate a comprehensive sales strategy or add value to an existing one. Primary amongst these is our Market Map. The Market Map is a visual representation of your target market and all the players in it so that you know immediately who to engage with and how to approach them. 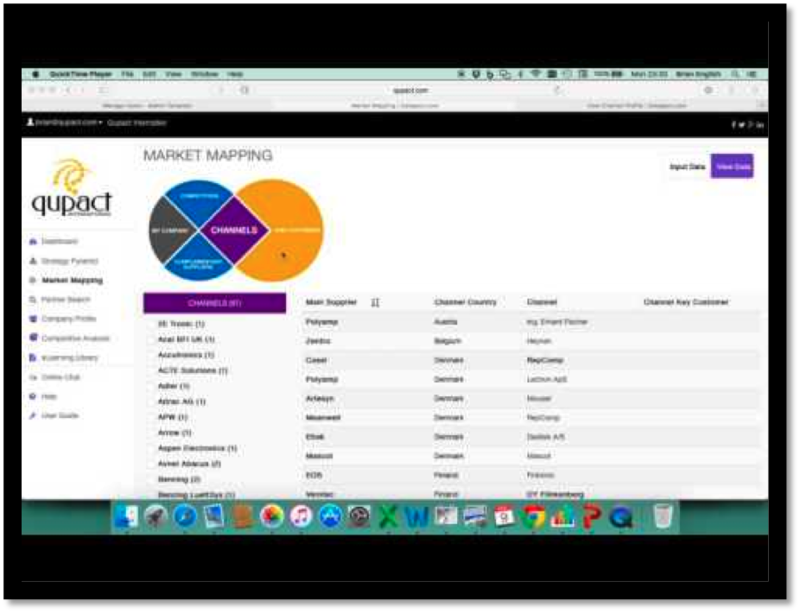 Traditional databases provide customers with endless lists and spreadsheets of companies, dataPACT’s Market Map shows the relationships between those companies; it is the transformation of raw data into intelligent, useful information. The importance of being able to identify the relationships between potential partners, competitors and suppliers of complimentary products cannot be overstated and is often the difference between success and failure during market entry, dataPACT’s Market Map put this information into our clients hands. dataPACT also a range of other features such as a partner prerequisites documents, interactive dashboard, structured partner proposition document formats and an extensive e-learning facility for early entrepreneurs and seasoned business people alike. All dataPACT features also allow for PDF export to assist clients in their own presentations. Whilst Qupact remains committed to utilizing dataPACT to manage our client’s sales channels as effectively as possible, we also want to make dataPACT available to those clients determined to develop their own sales channel strategy. If you need reps, distributors, VARs or retailers, visit us as www.qupact.com and see what dataPACT can do for your business. Before one can contemplate a distribution channel strategy, one must first understand what is a distribution channel. 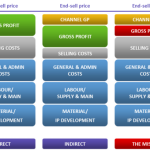 Distribution channels are the sequence of intermediaries that goods and services pass through until they reach the end-customer. In the contemporary global market place, distribution channels take many forms, from wholesalers and distributors to retailers and web-shops, and everything in between. These can be broken down into two essential categories; distributors such as retailers that take ownership of the goods along the path to the end-user, and representatives such as agents that do not take ownership but facilitate the movement of goods or services. Essentially, a distribution channel strategy facilitates the sale of goods and services in sectors or geographical markets that a company’s sales team cannot operate in directly for any given reason. The strategy may avail of any of the channels described above with different channels offering advantages and disadvantages depending on the type of company and its requirements. Successful companies will allocate appropriate resources to the upkeep of their distribution channel strategies because, in order for the channel to operate effectively, the company must maintain and exercise an appropriate level of control, communication and support to incorporate their changing needs. Active and sustained communication with the distribution channels also serves to promote the exchange of ideas across culturally diverse markets through the central company. This movement of ideas may inform advances, not only in distribution strategy, but also in the companies overall sales strategy. To develop an effective distribution strategy, a company must consider 5 primary factors: scope, expense, contribution, support and customer service. 1. Scope – The objective of any sales strategy is to grow the company. Identify the target market and all the players in it; distribution channels, competitors and suppliers of complimentary products. Decide on a structured set of criteria that the distribution channel must meet in order to provide the best fit for your company. For example, the channel must have revenue of 2-5 million euro, have operated in the market for 5 years and stock no competitive products. 2. Expense – Confirm the cost of establishing an indirect distribution channel strategy in your target market and compare it with the costs of setting up a network or direct sales team there. A direct sales team will incur all the expenses associated with processing, warehousing, distribution, invoicing and after-care whilst a distributor may incur lower margins through discount pricing. These costs will vary depending on the nature of the market and the goods sold, compare and make the right choice for your business. 3. Contribution – As mentioned above, sustained communication your distribution channels may encourage the exchange of ideas, which will contribute to the cultural and structural growth of your business. A more tangible aspect of distribution channel contribution will be access to additional customer base and market knowledge that will lower sales and marketing costs associated with initiating market research and advertising campaigns. 4. Support– As mentioned above, the sustained support and control of the distribution channel strategy is quintessential to its success. Support may take the form of a dedicated manager tasked with monitoring the distribution channel, identifying needs and offering knowledge based assistance or direct funding of sales and marketing activities. The level of support offered will depend on how significant the contribution of that distributions channel to overall revenue or the potential growth of the distribution network through that channel. 5. Customer Care – As with distribution channels, it is critical for companies to identify the target end-customers as part of their distribution channel strategy. Key accounts may need to be reached directly by the company to provide customer care or technical support beyond the capability of the distribution channel partner. In this instance, the channel may be responsible for larger scale customer care for the majority of customers, leaving the parent company with ample resources to look after the key accounts. This statement should include specific objectives and time lines for implementation. The plan marks milestones so that the degree of success can be measured and assist in motivating staff. 1. Which products are selected for export development? 2. What modifications, if any, must be made to adapt them for overseas markets? 3. Which countries are targeted for sales development? 4. In each country, what is the basic customer profile? 5. What marketing and distribution channels should be used to reach customers? 6. What special challenges are relevant to each market (competition, cultural differences, import controls, etc. ), and what strategy will be used to address them? 7. How will the product’s export sale price be determined? 8. What specific operational steps must be taken and when? 9. What will be the time frame for implementing each element of the plan? 10. What personnel and company resources will be dedicated to exporting? 11. What will be the cost in time and money for each element? 12. How will results be evaluated and used to modify the plan? A company’s export plan should closely resemble that of a business plan. It should include an executive summary, an export policy commitment statement, background analysis, a marketing component, action steps, export budget, implementation schedule and background information on target countries and market. The plan should be kept simple when first developed. As the exporter learns more about the exporting and the company’s competitive position, the export plan will become more detailed and complete. The objectives in the export plan should be compared with actual results, in order to measure the success of various strategies. The plan can be modified and more specific information added as the company gains more information and experience. Companies who plan on exporting directly require a detailed export plan; however, those who plan on exporting indirectly require a simple export plan. Formulating an export strategy based on good information and accurate assessment increases the opportunities for the company. The export plan increases the chances that the best options will be chosen, that resources will be used effectively, and that efforts will be carried through to success. Once a business has identified the market/markets to export to, the next step is to establish who will sell the product/service to potential customers and how it will be sold and distributed. How a business organises their sales presence in export markets is one of the key decisions to be made by an exporter. The choice of selling method will be influenced by the nature of the product/service. It is important to assess the usual local distribution practice with regard to similar products. Some larger companies prefer to purchase directly from the manufacturer without the services of a middleman. This typically involves making frequent sales visits to the particular country, as well as telephone sales or accepting of overseas orders on an e-commerce website. This can be a straightforward, cost effective way of entering overseas markets; however, it can have implications. It may leave the exporter remote from customers, and unable to share the exporting workload with partners or intermediaries. This is generally the most costly and time consuming method to enter an overseas market, however, it can be the most rewarding. Very few companies will be in a position to immediately set up their own office with resident personnel; however, this is often the long term objective in the key overseas markets. Furthermore, there are vital legal and financial implications involved in setting up in an overseas market. A company should seek legal advice from a solicitor and an accountant business adviser when considering this option. An overseas agent represents the exporter in the overseas market, sells the exporter’s product or service to the overseas customer and routes orders back to the domestic market. Once the goods are paid for by the customer, the overseas agent receives commission from the exporter. The commission varies from 2% to 15%, depending on the nature of the goods being handled. Commission should be included in the price quoted to the customer. It is essential to recruit a commission agent that has extensive experience in the particular business context, as well as relationships with potential buyers. A distributor buys the goods from the exporter, and then takes responsibility for selling them on to a third party. The role of a distributor is to find customers for the exporter’s goods. 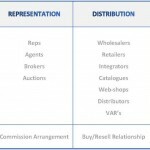 Distributors bridge the gap between the exporter and the end-user customers. It is imperative to seek legal advice before concluding a distributorship agreement. • Agreements made with agents and distributors should be formalised in a clear written contract! • Intellectual property – identify the rights the agent or distributor has regarding the use of company titles, brands, logos, etc. It is essential for a business to research overseas markets before embarking on marketing, promoting and selling a product or service within them. In order to be successful in the overseas market and to develop export sales channels, a business needs to find the most appropriate market and the best method to approach it. Furthermore, a clear understanding of the market or markets and how the product/service will fit within them will also increase chances of success. Entering an overseas market without this information could lead to very costly oversights. Knowing where to look for export information can be a daunting task for a business, particularly when they are not ‘au fait’ with the research process. Carrying out Market Research on Overseas Markets As mentioned above, market research consists of secondary and primary. Once a business has recognised that opportunities exist for them in the overseas market, these opportunities must be identified and quantified. Comprehensive secondary research (or desk research) is essential and will narrow the interest of a business down to a manageable number of markets. When exporting for the first time, it is advisable to concentrate on the traditional export markets which are the UK, EU and the USA, as they present fewer risks than other dissimilar countries. Secondary research may also be conducted to assist a business in gathering information under some or all of the following information categories. These include recent import statistics, size of local market for products, local economic data, competitors’ products and prices, import license, quota regulations and administration and tariffs to name but a few. It may also be necessary to conduct primary research (field research) within the potential market. This is particularly useful in assessing customer needs, wants and requirements. Primary research offers the benefit of direct contact, through a survey or interview, with certain markets and/or customer groups, and can be tailored to meet the needs of an organization and provide specific and detailed information. Exporters need to assess potential target countries and the purchasing behaviour of customers within them. In order to understand market issues, it is essential to fully understand local cultural influences. A product or service may be viewed as a basic commodity at home; however, this may not be the case in the overseas market. Another important factor to remember is that of language barriers. A business may need the local language in order to market the product effectively; otherwise access to professional translators may be necessary. A business that plans to export overseas must undertake research to assess how the export operation should be executed in the overseas market. Distribution channels available for selling between different markets will vary, and a business may need to locate local distributors. The most suitable skilled staff will also need to be sourced, with this in mind, it is critical to research whether they are available in the particular overseas market. A further area of consideration for a potential exporter is the access the potential target market has to a communications infrastructure, including, telephone, fax and internet. The quality of air, sea, road and rail transport available may also need to be examined, particularly for a business that may have special requirements, such as, temperature, fragility and sell by deadlines. Legislation varies greatly in markets overseas, which will subsequently affect how a business sells into them. An exporter may need to adjust a product or operational set up in order to comply with local laws. 1. What size is the potential market? 2. What is the political situation? – Is there an unstable political climate in the country? 3. Economic climate – is it favourable? 4. Culture – Are there barriers to the products success? Will the product have the same value here as in the domestic market? 1.	Who will buy the product? 2. What influences customers purchasing decisions? 3. What role will the product fulfill for the target market? 4. How much is the potential market willing to spend on the product? 5. How will I sell and promote the product? By answering these questions, a business should be able to tell whether they can successfully sell into a particular overseas market. •	Do not examine too many export markets at one time – refine your search! When successful businesses look to the future, they plan. Weeks of management time go into costing and revenue budgets, development spending, capital expenditure, market and many other functions. But it is surprising how often new exporters or companies trading in a traditional model neglect to adequately plan their route-to-market strategy. Warehouses all around the world are filled with great products that never made it to their target customers simply because the manufacturers failed to build the right route-to-market. So, how do you avoid this pitfall? Step 1: Develop a deep understanding of who will use your product or service and who will pay for it. Who makes the ultimate purchase decision and how will you influence that? Is this something you have to do yourself, can you entrust it entirely to your channel partner or do you need a multi-faceted plan to get decision-makers to choose your solution? Step 2: Research the market to establish which channel partners - for both competing and complementary products - are already influencing your target decision-makers. Keep a wide-open mind when you're doing this; you'll often find the best channel partners in the most unlikely places. Who would have believed you ten years ago if you'd told them that an on-line book-seller would rank amongst the world's biggest retailers within a decade? Step 3: when you’ve found the channels you want to work with, get the most senior person in your company to contact them and present a business case. Many companies treat this step as a product pitch that a sales or admin person can do. It’s not! It’s a business proposition based on a clear understanding of the partner’s revenues, margins, stock-turns and cash-flow management. The product fit has to be a given. Each of these steps takes time, careful planning and funding. You get one chance to impress and if you’ve chosen carefully and developed a really compelling value proposition, you will significantly increase your chances of securing that critical, first meeting. Today’s economy is very challenging and everybody is just pulling down the legs of each other to fetch the success. In order to beat our competitors, it is always required to move ahead with them using the best, newest and amazing approaches. Yes, you must need to take quick action as soon as possible as then only you can assure to have the best results for your company. Don’t have time to do so and don’t have idea how to fetch success for your business? No worries at all as here is the best solution which will definitely help you a lot in boosting your business without putting many efforts. We all know, what the most important things for any business are and we should think about getting the same. The very first thing, which we should have is to have the best business partners who can assure us great help and support – financial, physical and tactical assistance. Yes, it is highly necessary and for the same only the best experts can help you up. Apart from this, you should have the best and arranged Distribution Channels so that your product and services can easily be distributed by the best distributers to get you great help and support. You don’t need to worry about anything and leave the entire burden on the professionals who will ensure you develop your routes to market. Yes, professionals are aware with everything and they will help you in many ways so that you can easily get great support of your partners, get superb distributors, and lots of customers who are just looking to hire your products and services only. Even, you don’t need to worry about making Distribution Strategy at all, as this job will also be done by the hired professionals. Why don’t you try out the suggested source? Well, the same enterprise is working successfully since 2009 and offering great consultation to various businessmen to improve their business. Yes, they will offer you great consultation and make sure to work for you tactically so that your distribution channel works superb to meet the requirements of the people. The best team is always best in making Distribution Channel Strategy so well so that your products can easily reached to your ultimate users. Also, they ensure every process goes very well so that your goodwill in the market also promotes and you can get regular order in such a way. Even, as mentioned, you will also get the best business partners, who will ensure to buy your products and services from you to sell others for great profit, thus, must take help of the professionals and getting success will be easier for you. So, what are you waiting for? If you think your business is not earning so well and your Sales Channels are not working very well, you must need to charge everything once again using pro. So, must discuss all about your problems and you will surely get the best solution from them. For many companies the greatest challenge in setting up a channel network is in finding interested and appropriate partners, companies that are looking for just such a supplier at that point in time. Failure to find them often results in lost opportunities, frustration and dangerously, a rethink of and change in strategy. Once a company has decided it needs a channel infrastructure to reach its target customers in different markets, it has to stay with the process until it finds and engages the right partners. trainingPACT provides 14 pre-requisites which should be defined for each channel partner being sought - that's at every tier in the pyramid and in each market. 1. Location: Where should the channel be located? Must it have multiple locations? This is particularly important if it is expected to sell to customers in large geographical markets like Germany, France or the US. Remember here that restricting channels to regions, especially in the EU, is not always possible, so finding a partner with reach may be the best solution. 2. Scale: The partner needs to be big enough to represent you but small enough for you to be able to influence it and gain mindshare. As a rule of thumb, we look for distributors (or divisions of companies) for whom the year-two margin they will earn on your products/services represents 3% to 5% of their revenues. So, if for example, at 40% GM they can earn €500k in year-two as margin from your products (i.e. sales of €1,25M) we're looking for companies or divisions of companies with revenues of between €10M and €17M. 3. Segment: Establish in which vertical segment the bulk of the channel's business needs to be in order to ensure that it will already be dealing with your target customer group(s). 4. Years in Business: It may be important that the channel partner has been established in its segment for some time and has a track record. In the financial services sector, for example, this is often considered critical whereas with leading edge technology products it may not be. 5. Financial Strength: Should the partner be trading profitably? How much working capital must be available to fund receivables, inventory, sales promotions, marketing. What is the desired equity structure? Is there a VC involved? Is this good or bad? Whatever the criteria are, they should be clearly thought-through and defined. 6. Customer Base: From the target customer list (section 2), briefly describe the types of customers the channel should have. The acid test when you find a potential partner is to find out how many of your list of fifty targets they're already doing business with. 7. Synergies: Consider whether there are particular products or brands that are especially complimentary to your offering and that should therefore be present in the portfolio of the target partner. 8. Written Agreement: Many channel partners, especially smaller ones, are slow to enter into formal agreements, preferring to do business first. If a written agreement is a non-negotiable for you, note it here and eliminate early on, channels that do not meet this criterion. 9. Stock Order: Do you need a reseller to place a stock order? This can be a deal-breaker later on, so if it's vital to your business model, it has to be a definite pre-requisite from this point. 10. Joint Business Plan: The channel will have to do more than just react to opportunities. You will need to develop a plan to jointly develop and grow business for your products. Eliminate channels that want to work at arm's length and are not prepared to invest resources or make commitments. 11. Existing Business: Existing business can be a problem if you want to retain these customers. The partner will probably see all the customers in the market as "his" and will not want you cherry-picking. Clarify your position with regard to existing business and stick with it. 12. Exclusivity: Exclusivity is only enforceable in agency agreements in the EU. The trainingPACT program discusses exclusivity in detail and provides in-depth guidance on how to manage this issue. 13. Branding: Are you seeking only channel partners who will sell your brand or will you also consider private labelling? 14.Timing: Make sure that the target partner(s) can move to an agreement within the timeframe demanded by your business. 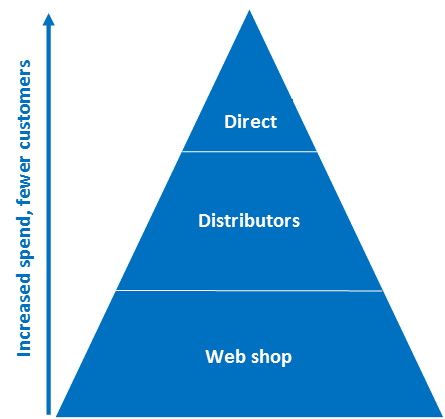 Most businesses can describe their customer base in a pyramid in which the average customer spend increases and the number of customers decreases as you move up the pyramid. In the bottom tier are many small customers. The number of tiers in your particular business is entirely defined by you and it is quite possible that in a 5-tier pyramid, only the top-tier customers are dealt with directly and all other tiers are handled by channel partners. The purpose of the pyramid is to force the supplier to precisely define its channel strategy for the customers it is targeting in each tier of the pyramid. To do this, it has to describe eight different parameters for each tier. Products -Many businesses sell different products and services (or even volumes, configurations, bundles, etc) to different customer groups. Stating what is to be sold to the customers at each tier in the pyramid is a critical starting point as this will have a significant impact on the channel management strategy. Customer Description -Next, you need to describe the end-customers in this tier. Are they manufacturers, service companies, independent consultants? Are they self-employed, SME's, nonprofit organisations? Number of Customers -Knowing how many potential customers there are in the target market makes it possible to establish if the sales objectives are realistic. Not knowing this means that the market-entry strategy is founded on hope rather than data. It's not an exact number, but an order of magnitude estimate. Program spend -Smaller customers will spend less than larger ones. That's why we classify them as small. Whether you're delivering a hosted service like Salesforce.com or electronic components like NXP, try to define the "typical program spend" for each tier. In the case of these two examples, this might mean the average number of subscriptions per company in that tier to Salesforce which will equate to the annual revenue per company. For NXP it may be the typical semiconductor spend for a company on each product it develops. So, moving up the pyramid, the number of programs per customer increases as well as the spend per program. Demand Creation and Fulfillment -Recognise who creates the demand for your product at the customer, irrespective of who delivers it. For example, you may need to generate all leads yourself through your website with Google Ads, mailings, radio advertising and so on, but they may all be followed up and fulfilled by a third party partner. Conversely, you may have a partner who is doing all the lead generation, but because your enterprise software is complex and has to be customised, you may have to close the sale and commission the product yourself. Sales Strategy -What will your sales strategy be? 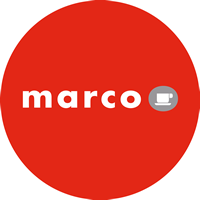 For example, if you have a tier for catalogue distributors such as Argos in the UK or Wehkamp in Germany, the strategy might be to simply provide the product to these channels and support them with all the resource at your disposal. On the other hand, it could also be to provide the channels with the minimum support they require and expend your resources on building the brand through space advertising, direct mail, etc in order to drive customers to the catalog resellers. It will be important to work this strategy out very carefully and to ensure that the channel partner in the tier supports it. Examples -Before you begin investing resources and money in a market penetration it is vital to identify your target customers. It's not generally enough to describe them in terms of generic characteristics (unless, of course, you're in a B2C environment). You need to be able to name names and more than just a few. You can expect about one-in-seven leads to move to the engagement phase. In traditional sales environments this means getting a meeting; in distance selling it means engaged in a two-way dialog with you either by phone, eMail or via the web. About one-in-fi ve of these engagements will result in a sale, in the short-term. Conclusion - To close one piece of business in the short-term, you need to have a minimum of 35 identified leads. We have been in many customer situations where the client has identified twenty target customers in the new market and believes that he can close half of them in the first year. Predictably, the reality is very often disappointment and frustration. We encourage clients to identify at least 50 qualified prospects before going into a new market. There are many different types of channel partners including direct sales people, the Internet, distributors and referral partners who will simply recommend your products or services to their customers. What differentiates them from one another is the proportion of the end-sell price they absorb, the control you, as a supplier, have over their activities and how complex they are to support and manage. In general, as the cost absorbed by the channel and the control you have over its activities increase, so too does the complexity of managing it. Consider the extremes; you have no control over a referral partner, but it also receives no payment from the end-sell price of the product. It's simple to manage. Direct sales people, on the other hand, require huge management effort, are expensive to fund and all of their activities are fully controlled by their employer. No matter which type of channel you're dealing with, the commercial transaction falls into one of three categories. These distinctions determine the legal relationship the supplier has with the channel partner and are therefore of critical importance. Representative transaction -The basic commercial contract (offer, acceptance, consideration, product/service delivery) is between the vendor and the customer. The rep never handles the goods, the invoice or the payment. After the transaction is completed he is rewarded by the vendor. In general, this payment is not visible to the customer. Distributor transaction - The distributor transaction, on the other hand is entirely different and consists of two separate contracts, one between the vendor and the distributor, the other between the distributor and his customer. In both cases there are unrelated cycles of delivery, invoicing and payment, the only common thread being the product traded. Referral transaction - In the referral transaction the partner has no commercial role at all and does not receive a payment. If he does, he is then a representative and not a referral partner. Available Channel Structures - A channel is defined as any person or body corporate that facilitates the sale of a company's products or services for reward. In the case of unpaid referral partners, this reward has to be seen as an enhancement to the value they offer their customers. For all other types of channel partners, it's financial. There is a wide variety of available channel partners to choose from, but in terms of classification, they all fall into one of two categories: distributors who take title to the goods or representatives, who don't. Products, technology or price don’t buy mindshare – it’s all in the relationship. For exporters looking to nurture relationships with overseas companies, the Canons of Channel Management can transform the approach to channel management, writes Brian English of Qupact International. A number of years ago we were helping a company in Cork to assess why its sales channels were not performing and what needed to be done to derive more revenue from them. One channel, in particular, was something of a mystery as the product fit was perfect and the customers it was dealing with were the exact targets that the Irish exporter was looking for. It was based in Norway and the deeper we probed, the greater the mystery became. Finally, we asked the obvious question – when was the last time you visited this partner? And the answer floored us – between seven and eight years ago! If there’s one thing that 25 years of channel management has taught us, it’s that it’s all in the relationship. 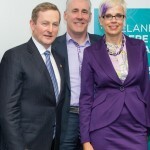 Products, technology or price don’t buy mindshare; this is something only a solid and enduring business relationship can capture, and the biggest challenge for the typical mono-lingual, island-dwelling exporter is cultivating and nurturing a long-term relationship with an overseas partner. Over the years, we have honed a set of principles, which we call the Canons of Channel Management. We stick them on exporters’ walls and drill them into sales managers and CEOs up and down the country. Together, the Canons crystallise an attitude to a company’s channel partners that has to be shared by everyone in the exporting organisation. When they are fully embraced and used to inform day-to-day decisions, a company’s whole orientation towards its external sales partners – its feet on the street in overseas markets – is transformed. 1. Resources: Place your channels at the centre of your universe and organise your resources around them An exporter needs to recognise that its channels are a legitimate part of its sales organisation and not an external add-on. Only when it embraces this philosophy will it be able to adequately resource the channel sales support organisation. This includes everyone from materials planning to after-sales service. 2. Reward: Know who in the channel is ultimately responsible for sales of your products and identify everyone who is rewarded for selling them. In every channel partner, you need a champion. He/she is the person who has a vested interest in your products or services succeeding. His reward may be monetary or it may come in the form of kudos, peer recognition or the satisfaction of his customers. 3. Risk: Never expect the channel to take a risk with its business that you would not take with your own Too many manufacturers expect their channels to take risks – with creditors, inventory, regulations and margins – that they would never take with their own businesses. This is a real acid test of the exporter’s level of understanding of the partner’s business. 4. Relations: Remember that the end-customer relationships are the channel’s, not yours – that’s why you’re using the channel in the first place In the complex, global economy we live in, customers very often trust and rely upon their local suppliers on whom they have depended for many years and who have given them loyal service in good times and bad. Exporters often forget why they engaged the channel in the first place – because it owns these relationships. Continuing to remember that and respecting the channel’s value in the supply chain is vital to build long-lasting relationships. 5. Face Time: Maximise face time Once in seven years is not enough! As an exporter, you need to plan to see your channel partners on a quarterly basis for the first year or two and after that, at least twice a year. Break bread together and make small talk, whatever it takes to build a person-to-person connection and see them whenever you can. 6. Loyalty: At all times, demonstrate unswerving loyalty and long-term commitment We often compare channels to life partners and, when it comes to loyalty, there is no better analogy. Once trust is betrayed, it is very difficult – or impossible – to rebuild. Years of hard work can be undone with a single, bad decision driven by a lack of communication, greed or misunderstanding of a situation. In the final analysis, the relationship is not between companies, but between people, and it is therefore built on trust and loyalty. 7. Honesty: Be honest and transparent in all your dealings It’s certainly possible to deceive all of the people some of the time or vice versa, but it’s never possible to build a lasting business relationship unless there is openness and honesty between the partners. Dealing with a channel conflict openly, with full disclosure, is more likely to strengthen a relationship than to damage it. Qupact International is a Dutch-based consultancy with a company in Dublin, that specialised in sales channel development. 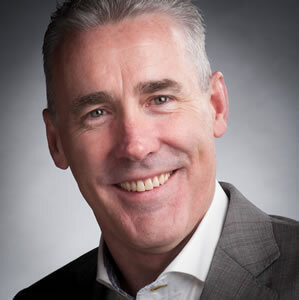 Its CEO, Brian English, is Irish-born and educated and has been living in the Netherlands for more than 20 years. If you are looking for better growth and development of your business, there is nothing better than the best sales partner to assure you the best results. Yes, all you just need to find out talented, experienced and amazing sales partners who can assure you the best results all the time. We all know the current market very well and can easily find a lot of competition in almost everything products and services we found around us. However, this becomes a very complex challenge for all to earn by running business very well. So, here we come up with the best solution will help you to enjoy amazing growth and sales, you have ever expected before. So, are you ready to know more about the best company which can assure you to give various services to take your business to the next level? Here is the complete information. Market mapping Market mapping is all about analysis of market and make sure to generate various information by accumulating great data. All you just need to hire the same and experts will learn everything about your company and accordingly will check the market to come up with the best conclusions. Yes, they relate your company to the market and make sure to give you the best Channel Management Strategy to accomplish mission and vision of the company. Market entry strategy If you are a newbie and looking for great sales, you can expect to have a multi-tier and route to market strategy will definitely help you to enter in the market successfully as well as making great list of customers easily. Yes, it doesn’t matter what company you are forming and who you are, experts will help you in each and every cases and assure you the best results only. Partner search Are you looking for the best partner who can help you in pushing your sales? Well, with the help of Export Sales Channels team you can expect to have one or more partners from your target markets. Yes, and once you will get the same you can assure to have a great sales and access in each and every target market, successfully. Competitive analysis Competitive analysis is must and this will help you to build up better strategies than your competitors. Using the best experts, you will surely get the best Export Sales Partners as well as you will aware with the strategies opted by your competitors to beat you up. You can assure to know all the strategies and by intelligently manipulating the same you can easily make great fortune for your business. From dealing with conflict between competing channels to implementing fair pricing policies, in the world of the international channel manager, there is never a dull moment. With ever-increasing complexity in the relationships that suppliers have with their various channel partners, it is often difficult to establish rules and practices that can be applied universally. Having said this, there are some fundamentals that never change and 5 of the most common pitfalls that we've encountered in 25 years of developing sales through channels are as follows. Effective Channel Development Tip 1 - expect the channel to take a business risk that you would not be prepared to take - many suppliers feel the channel should be prepared to takes risks (carrying inventory, extending warranty, providing customer credit, for example) that the it would not be prepared to take in that market. If it's not an acceptable business risk for you, the chances are, it's a bad choice for your channel partner as well. Effective Channel Development Tip 2 - Remember that the end-customers are the channel's, not yours. The reason you're using the channel in the first place is because it has relationships with your target customers. The day you damage the channel's relationship with its end-customer or try to take it over, is the day the channel stops trusting you as a supplier. Effective Channel Development Tip 3 - Maximise face-time - in the electronically-connected world in which we live, it's easy to replace face-time with conference calls, eLearning, eMail and social-media messaging. But people are still people and the especially where there are language and cultural barriers, the importance of meeting people and braking bread with your partners has never been greater. Effective Channel Development Tip 5 - Demonstrate unswerving loyalty - like any partnership, a channel relationship depends hugely on the trust that exists between the two people responsible for its day-to-day functioning. Break that trust once and it's almost impossible to rebuild. So, don't make promises your organisation can't keep and never let the channel find out about your plans for its market from a third party. All of these are common-sense, but we are constantly amazed at the number of times exporters infringe or ignore the basics. The creation of the single market has brought many advantages to companies throughout Europe who can export with ease to customers throughout the EU – something that was impossible just 50 years ago. However, as in every walk of life, freedom brings with it tremendous responsibility. In this case, the responsibilities that companies have to exploit the free movement of goods, capital and labour without compromising consumers’ freedom to put their suppliers into competition with one another. The EU hates price controls, cartels and restrictive practices aimed at artificially maintaining price levels, either through price-maintenance agreements or by restricting supply in order to drive prices up. The continent is littered with examples of companies that have felt the wrath of the regulator in this regard. So, bear in mind when you’re putting together your pricing or discount structures for Europe, that restrictive practices (like agreeing minimum resell pricing with your distributor) are likely to land you in the worst can of trouble. Differential pricing can also be a major problem because, as a supplier you are not allowed to create advantages or disadvantages for competing distributors through your pricing strategy. Does this mean that all EU distributors have to be able to buy at the same price? Basically, if they can theoretically compete with one another, yes! Now you could certainly argue that a Tesco store in Spain doesn’t compete with a Tesco store in Wolverhampton and that you can therefore offer them different pricing. This argument is reasonable and probably wouldn’t cause you any difficulties. You can also allow your pricing to reflect transport costs if your ship DDP or sales volumes. But if you sell a product that can easily be sources across national borders, then you need to be very careful. For example, if you’re selling machine parts to OEMs in Germany that could buy them as easily from a distributor in France as in Sweden. Then you have to make sure that neither the German, French or Swedish distributor has a competitive advantage over the others that is based on price. If you’re in doubt, get professional advice before you start setting prices and creating precedents. It’s a hotly monitored area in EU practices and you’re responsible for knowing what you’re doing within the freedoms created by the single market. Many people lose the will to live when it comes to differentiating between the different types of channel partners that are available in export markets. One man’s ‘dealer’ is another man’s ‘agent’ and people often use the terms ‘wholesaler’ and ‘ distributor’ interchangeably. But don’t let the jargon fry your brain! 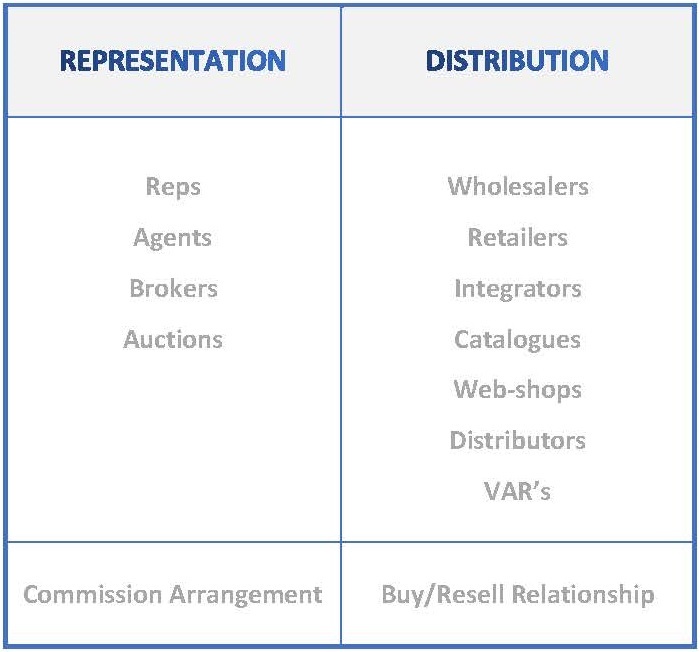 Apart from licensing, franchising and joint ventures, you can pretty much split all of the other types of trading partnerships into one of two categories: Representation or Distribution. If you think what you are really doing with a channel, it will be either a commission arrangement or a buy/resell relationship. It doesn’t matter what the text in the agreement says – if your partner buys the product from you and sells it to someone else, it’s a distribution arrangement. If he has continuing authority to negotiate pricing with customers on your behalf, he’s a rep. Here’s a split of some commonly used terms to describe partners, showing which type of arrangement they constitute. For a wider discussion on this topic, register for free as a BASIC USER at www.qupact.com and check out the section in our eLearning library. Since its establishment in 2003, Qupact has trained hundreds of CEOs and senior managers in its channel development and management techniques. In doing so, Qupact's Managing Director, Brian English has established a reputation throughout Europe as a leading expert in this field and is often called on to speak at industry events or to provide specialist content at seminars. In January of this year,Enterprise Ireland organised a seminar in Düsseldorf to promote trade relations between Irish and German companies. Mr. English was invited to speak to the Irish exporters on the subject of channel partner engagement in Germany along with a number of other experts in the fields of recruitment, tax law, legal requirements and eMarketing. 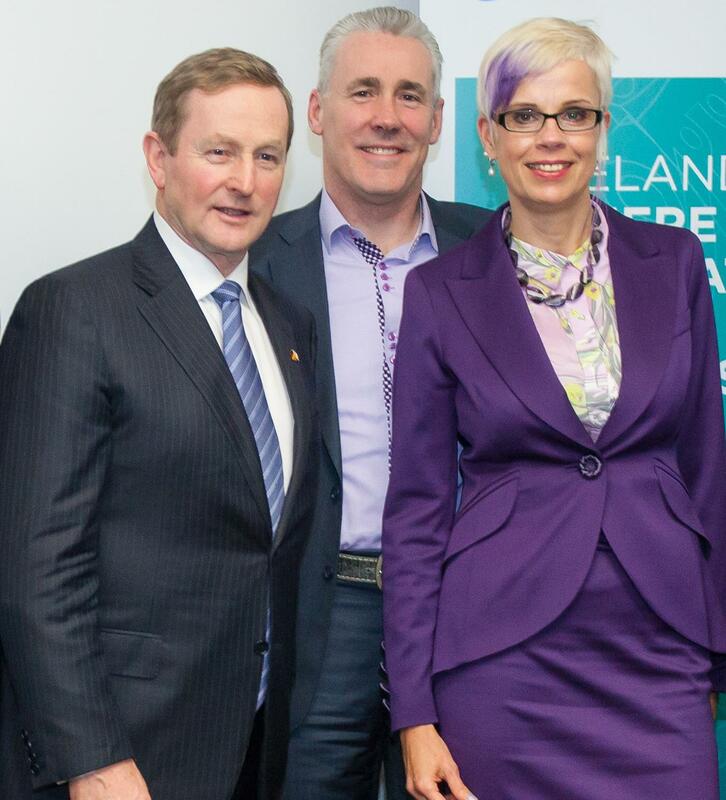 The seminar was attended by the Irish prime minister, Enda Kenny and the head of Enterprise Ireland, Julie Sinnamon who also joined the presenters and attendees for a dinner that evening in the Industrie Club in Düsseldorf. Qupact MD, Brian English, pictured with Irish Prime Minister, Enda Kenny and fellow-presenter on the day, Susanne Dirks of e-Vorsprung Consulting in Dublin. There is a common perception in industry, especially amongst smaller customers that using distributors or other middle men amounts only to “giving away margin”. 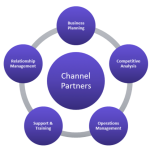 The perception is completely understandable, but it derives from a lack of understanding of the channel partner model. Take the example of a manufacturing company that has a cost of goods sold and general and administrative costs (G&A) to run the business. It only sells directly to end customers, so it also has direct sales costs. What’s left when all of these are deducted from the end-sell price is gross profit. Now consider what happens when this company decides to sell its products through a distributor. This decision does not impact on the cost of manufacturing the goods or, for the most part, on the G&A costs of running the business. Neither does it impact the end-sell price – in general, the customer is not going to pay significantly more to buy it from your distributor, so the end-sell price remains the same. In order for the supplier to maintain its actual margin, the distributor’s margin has to be funded from the supplier’s selling costs. This requires a fundamental change in the vendor’s business model. The transfer of selling activities to the channel is accompanied by a transfer of selling costs. If vendor selling activities and resources are not replaced by lower cost channel management activities and resources, the channel margin ends up being funded, not by transferred costs, but by vendor margin. This is the classical mistake which is made by thousands of companies and it is repeated by some, over and over again. There are fundamental differences in the skill set and cost structure of the team required to support sales channel partners and the team responsible for executing direct sales. A sales strategy pyramid is a tool that assists in developing customer segmentation and channel strategies for your company. The pyramid gives a total picture of customers you serve at the moment and customers you want to serve in the near future. 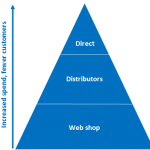 The purpose of the pyramid is to force the supplier to precisely define its channel strategy for the customers it is targeting in each tier of the pyramid. Most businesses can describe their customer base in a pyramid in which the average customer spend increases and the number of customers decreases as you move up the pyramid. In the bottom tier there are many small customers. The number of tiers in your particular business is entirely defined by you and it is quite possible that in a 5-tier pyramid, only the top-tier customers are dealt with directly and all other tiers are handled by channel partners. Let’s illustrate this with a real life example of a company selling medical wear. Direct customers are served without involving third parties. The company has its own sales force and serves these customers directly from Ireland. Customers are only a few dozen in number but generate 50% of revenues. Distributors are channel partners and they can reach thousands of customers in different geographical regions. This indirect channel also sells other products such as school wear and sports clothing. Web shops can reach tens of thousands of customers, most of the time individual practitioners. The company’s sales strategy is to generate web traffic and it creates demand through e-mail marketing. The above example illustrates how much value channel partners can add to your business. These partners have their own sales strategies and bear all of the selling costs. There are different parameters for each tier and by using them you can build your own sales strategy pyramid. Have a look at our web app and try it yourself! Partner management, also called channel management or relationship management, is one of the most important activities companies have to have under control. If third party channels are going to be your preferred Route to Market, place them at the centre of your business universe and place your processes and resources around them. At Qupact we see channel management not as something that is “additional” to your company, but as the life-blood of your business. Companies should be engaged in a support process for the channel partner, rather than in a managing role by lecturing the channel partner on how to do better. 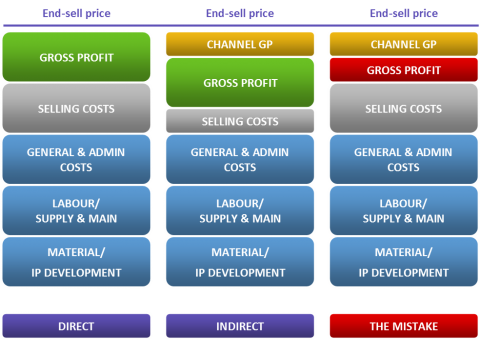 You can add as many processes as you like to this diagram; the main point is that channel partners should always be at the centre of the business if they are your Route to Market. It can be the case that your channel partner is performing poorly. It is then important to understand the reasons why. Is it the margins? Or the training? Or maybe the cash flow? Together with your channel partner, you should attack the problems and try to solve them. Fixing is almost always preferable to starting over.